As common names go, groundnut doesn't quite seem fitting for such a distinctive plant. Known scientifically as Apios americana, this leguminous vine can be found growing along a variety of edge habitats throughout much of eastern North America. It becomes most obvious to passers by from July through September when it is flowering. Okay, to be fair, groundnut is a fairly accurate description. Not only are the seeds of this vine edible, so too are the starchy tubers it grows from. However, I think this all detracts from a rather intriguing ecology. Populations of groundnut occur in one of two forms - diploid (2 sets of chromosomes) or triploid (three sets of chromosomes). It would seem that entire populations can sometimes consist of the triploid variety. This is a bit odd because triploid plants are sterile. Though they produce seemingly functional flowers, they never produce seed. Instead, these populations reproduce vegetatively via their underground tubers. Other than their lack of reproductive ability, there doesn't seem to be any other noticeable differences between diploids and triploids. Whatever the reason, it is obviously working for the groundnut. Speaking of reproduction, there seems to be a bit of mystery concerning the types of pollinators targeted by this vine. Groundnut flowers, with their carrion-like appearance and strange odor, may be attracting carrion flies. Some authors are rather set on this hypothesis despite very little evidence. A more thorough investigation into the pollination ecology of groundnut revealed that bees were the only visitors, however, nothing conclusive could be said about their effectiveness. What can be said is that the flowers require insects of a certain size for pollination to occur. The flowers themselves are essentially miniature spring traps. When insects of a certain size land on the flowers they trigger the release of the anthers, which slam into the insect, dusting it with pollen. This is a very similar strategy to a close relative of groundnut, alfalfa (Medicago sativa), which is definitely bee pollinated. Despite all of the confusion surrounding groundnut, it is nonetheless a great species. It fixes nitrogen, provides food for wildlife and humans alike, and looks really cool to boot. This would be a great addition to a native plant garden throughout its range. Legumes are famous the world over for their nitrogen fixing capabilities. These hardy plants can live in soils that would otherwise not support much of anything. As such, nitrogen fixation is one reason that the legumes have found themselves as a focus of agriculture. However, this ability is not solely the plants doing nor has it evolved to benefit humans. Legumes owe their ability to turn a gas into food to a symbiotic relationship with special soil bacteria known collectively as "rhizobia." The legumes produce special root structures called "nodules" to house these bacteria. In return for nitrogen, the bacteria receive carbohydrates and other organic compounds. The nature of this relationship may seem pretty straight forward but, as with anything in nature, the closer we look the more interesting things get. As it turns out, rhizobia also play a role in plant defense. 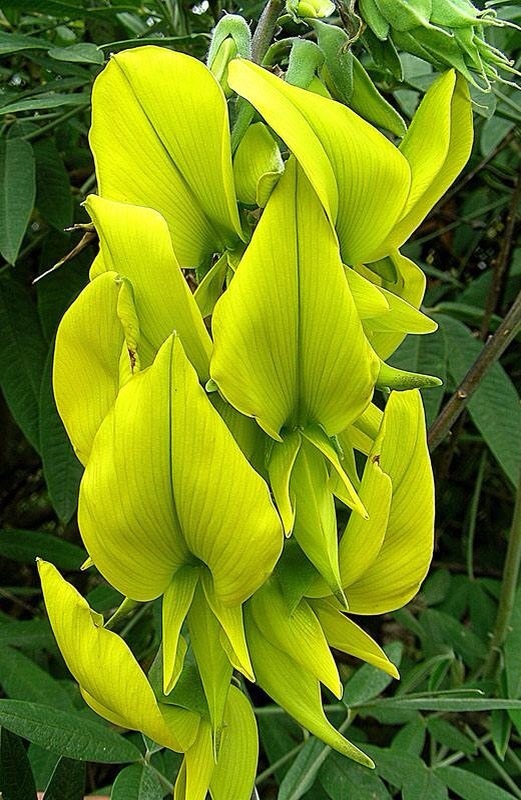 When a team of researchers began raising Crotalaria, a genus of legume native to Africa, they noticed something strange. Plants that were not inoculated with rhizobia didn't produce nodules nor were they producing any of the alkaloid chemicals that defend them from herbivores. Even adding artificial nitrogen to the soil didn't stimulate the plants to produce their chemical cocktails. Something was going on here and it would seem that the missing bacteria were the key to the puzzle. Indeed, only after the plants were inoculated with their native rhizobia did they begin producing nodules and eventually the defensive alkaloid compounds. Could it be that the bacteria produce these chemicals for the plant? Not quite. As it turns out, the area of biosynthesis for these defense compounds happens to be in the root nodules that house the rhizobia. The rhizobia trigger the production of the nodules, which in turn triggers the production of the alkaloids. From there, the plant can export them to above-ground structures as a means of defense. The bacteria are simply a key that unlocks a genetic pathway for defense. Seeing as the alkaloids are, in part, made from nitrogenous molecules, this is not too surprising. There is no sense in trying to make these compounds if the chemical ingredients aren't there. This research serves as further evidence of how complex the microbiome can be. Did you know that peanuts are not nuts at all? More accurately, they are a type of legume. What are you are actually eating are the cotyledons and embryo of the next generation of plants. Despite their popularity around the world, the plant itself gets very little attention outside of agricultural circles. This is a shame as the ecology of the peanut is truly fascinating. The plant that produces the peanuts that the world either loves or fears is known scientifically as Arachis hypogaea. It was originally native to South America and it is believed to have first been domesticated in Paraguay over 7,000 years ago. Domestic peanuts are amphidiploid or allotetraploid meaning they have two sets of chromosomes from two different parent species. Research points to a natural hybridization event between Arachis duranensis and Arachis ipaensis, which produced the tetraploid Arachis monticola. It is A. monticola that gave rise to the domestic peanut we know today. As a plant, it looks rather much like most pinnate legumes. Its yellow flowers are unmistakably pea-like. It is only after they have been pollinated that they become truly bizarre. Members of this genus exhibit what is called "geocarpy." This relatively rare form of plant reproduction involves the plant literally planting its own seeds. After fertilization, the flower stalk elongates and bends towards the ground. Once it touches soil, the stalk pushes the developing seed pod down into the dirt. Underground, the seeds mature and germinate. The embryos will only become active in the dark, subterranean environment. This is especially useful in habitats where soil disturbance is a frequent occurrence. Geocarpic plants like the peanut increase the likelihood that their offspring will survive long enough to germinate and grow by skipping over that pesky seed dispersal step. Keep that in mind the next time you tuck into a bag of peanuts.